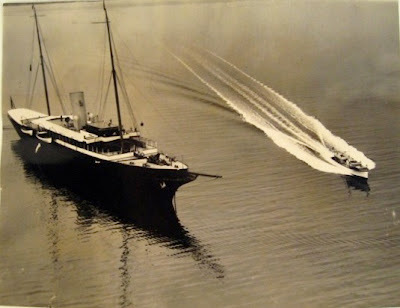 J.P. Morgan Jr.'s yacht Corsair ready to leave Glen Cove in 1934. Click HERE to see Morgan's estate 'Matinecock Point' designed by Christopher Grant LaFarge c. 1913 on East Island in Glen Cove. Click HERE for more on the Corsair yachts on the New York Social Diary. As Morgan Sr. once said, "if you have to ask, you probably can't afford it"
Incidentally, Corsair was built at the Bath Shipyard here in Maine. We look at it in this photo and we're moved both by its graceful lines, and its tasteful opulence. What isn't entirely clear is its size: At 343 feet, it was likely around 150 feet and more LONGER than the Morgan house at Matinecock Point. Think about it. I don't own a hardcopy of this photo but it was among a number that sold at auction a few months ago that were part of a larger collection of Morgan family yachting possessions. Today's word verification, "prime", is so appropriate for the subject of today's post. Also, great commuter yachton right of photo. My dad often told us about how he and his friends used to canoe under the bow of this magnificent yacht (while it was at anchor, of course). If any of you ever get to visit the Model Room of the New York Yacht Club, there is a large scale model of the Corsair (once the NYYC flagship)on display that is incredible. It features "cutaways" in the hull that allow you to peak into stateroom, head, coal bin, etc. Memorable, to say the least. OFLI, I have indeed seen the model of Corsair at NYYC. Just extraordinary---as are so many of the models in that equally extraordinary room. There is also a magnificent model of the Corsair at the Maine Maritime Museum in Bath. It was made for the lobby of the Bath Ironworks, where Corsair was built. The fittings on that model are of gold to imitate the brass ones on the actual boat. Also on file at the Museum are the plans for Corsair. The various Corsairs plied Maine waters often---Mrs. Morgan Sr. and two of Morgan's Jr.s sisters all summered there (as did Morgan Sr.'s mistress), and the local Society columns of the day are full of tales of dinners held aboard the yacht, with sparkling guest lists, and tales of launches back and forth to shore. In his memoirs, Louis Auchincloss tells a marvelous tale of one Bar Harbor summer when his parents were summoned to dinner (his father sometime represented some of the Morgan interests). His mother, already invited to another party, made a social lie to her hostess of the sort that we're encouraged not to make as children, thus enabling them to go to the Morgan party. When called up by her children for the hypocrisy, she said that someday they would understand the necessity. JP Morgan Chase owns a collection of dinnerware from the Corsair- terribly chic and elegant, emblazoned with the Corsair's flags (I think there's a nautical term for those triangular flags, but it escapes me) and comprising all sorts of items that no self respecting plutocrat would set to sea without: bouillon cups, oyster plates, celery dishes and the like. I'v driven past the Bath Iron works, but unfortunately, did not get a chance to stop in. I spent a few days at Small Point, Beautiful, but as one cruising book put it "... has mosquitos the size of sea gulls". The small triangular flag you're referring to might be a burgee. For those of you interested in steam yachts, I would recommend the coffee table book, "The Steam Yachts: An Era of Elegance", by Erik Hoffman. Very nice book. In addition to the Ocean going yachts, it also features fast commuters, also owned by many of the North Shore's finest (such as the one pictured near the Corsair). On a nice day, it sure beatsa private train car or limo. Magnus, love the details about the Corsair service. Quite remarkable, given the generally more casual air about even high end yachting nowadays, to think of the Morgans and their guests properly dressed for dinner, sitting down to delicate cups of consomme. The last time I was on a big yacht, a few months ago, it was ketchup bottles all the way. On the other hand, my great-grandfather, who was not particularly fancy in the big scheme of things, never went sailing without a tie, right into the 1960's. That era is very gone. OFLI, I have personally never seen a mosquito bigger than a sparrow up here, but I have heard of larger. I remember a summer evening many years ago, much too warm. I went down to the yacht club with the idea that I'd row a dinghy out to the center of the harbor and enjoy the still evening twilight. You'd think I'd know better in Maine at dusk in the summer. I lasted less than five minutes. I still remember the sound, like a million little dive bombers. It was like a scene in a horror movie---think 'The Birds' recast with mosquitoes. I'm never clear on Morgan, Morgan Jr. - who owned "Matinecock Point"? Did Sr. first have property, then Jr. inherited? If I read the upside-down date(1894) stamped on copy I have - this yacht is Corsair II. Corsair I was a 185-foot purchase(1882) from Charles J. Osborn(Jay Gould's private banker}. Corsair II was 241-feet, commissioned after his father died around 1890. Designed by J. Frederick Tams and John Beavor-Webb. Corsair III was 304 feet built in 1899 by T. S. Marvel of Newburgh, NY. Corsair IV built at the Bath Works in 1929 was 343 feet. Half & Half, Morgan Sr.'s country estate was on the west bank of the Hudson River. As far as I know he never owned Matinecock.